Getting a pair of thick, full and perfectly arched eyebrows doesn't have to be a daily struggle. Microblading can help permanently get rid of your thin eyebrows for good. Transform your blah-brows to wow-brows with long lasting microblading permanent makeup from Organic Spa Houston! Microblading is a form of semi permanent makeup for the eyebrows. The technique includes the use of a handheld microblade, which certified and trained Permanent Makeup artists use to hand draw each individual hair stroke. By using a handheld microblade, instead of a machine which is used in classical PMU, the drawn-in hair strokes will blend in with the client's existing eyebrow hair. As a result, microblading will give the client's eyebrows a more natural and lifelike look. This permanent makeup technique is perfect for people who have over plucked eyebrows or are looking to give their brows more shape and color. giving a more natural look and feel. Why You Should Choose Organic Spa Houston for your Microblading Needs? At Organic Spa Houston, we take customer satisfaction seriously. We care about our clients' health and safety. That is why our licensed skin care professionals are advanced-level trained and certified in Permanent Cosmetic to create beautifully symmetrical brows, re-designing the brows shape and adding hairs to sparse brows area. Your safety is our utmost concern therefore, strict sanitation and sterilization guidelines are followed in accordance with OSHA and the CDC. Single use, sterile, disposable blades and needles synonymous with gentle, painless, and stress free acupuncture are used to ensure accuracy of the pigment placement and provide clients' comfort during treatment. To ensure longer-lasting colour retention results we offer nontoxic, vegan friendly pigments options (our synthetic color pigments are: exclusively made for microblading and PMU and allow easy application with excellent color retention. Tartrazine free, as it is highly allergic artifical coloring additive. Therefore, risk of our client experiencing allergic reaction is very low. It is not possible to develop reddish shadows or blue shadows - 0% Ferrum Oxydes, 0% Nickle, 0% heavy metals, 100% comply to Resap 2008-1. It does not migrate under the skin). The main advantage of using our exclusive, quality pigments is that our clients are not exposed to toxic metals, that usually can be found in 98% of semi permanent pigment brands. What to Expect During a Standard Microblading Appointment? 1. Profile the client. First the microblading artist will assess the client’s lifestyle and taste. Do they want something bold or natural? Do they wear makeup everyday or just special occasions? What face shape does the client have? This interview will help the artist create the best brows for their client. 2. Draw on the eyebrows. Next the artist will draw the eyebrows directly on the client’s face with a waterproof eyebrow pencil. This will be the artist’s guide for the microblading procedure. This also allows the client to see the final look before any permanent work is performed. 3. Microblading. Now the artist begins microblading, according to the drawing they’ve agreed upon with the client. 4. Remove the excess ink. Once the microblading is finished, the artist wipes excess ink off and the client can see their new eyebrows! Except for some redness, the client will be ready to go back out in public immediately and with no problems. 5. Photography. All microblading artists photograph their work for many reasons, not the least of which, to have a record of their own art! The most natural and soft, high-definition looking wow-brows! Results are presto perfecto, contour face. Recommended for: All hair types and all skin tones, blonde & red color hair, thin / thinning eyebrows, droopy eyes. Alopecia / post-chemo brows rejuvenation. NOT Recommended for: Skin type 5 and 6. Dark skin tone color (please see Microblading + Microshading). 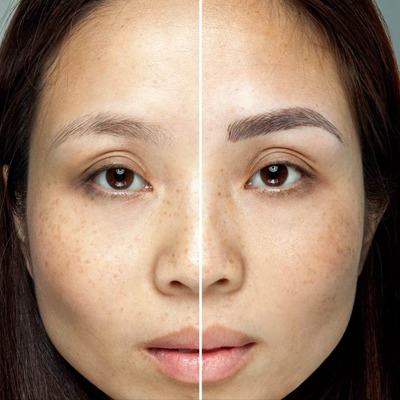 Turn shapeless brows into lifted, defined brows. This technique blends microblading method with powder-in ombre method resulting in a polished pair of beautifully arched brows. Pst! Professional Makeup Artists everywhere love this look! Recommended for: All hair types and all skin tones, especially darker skin tones, sparse / thin eyebrows, droopy eyes. Alopecia / post-chemo brows rejuvenation. Men can have thick, bold and full brows, too. Turn those uneven, sparse brows into handsome brows. Recommended for: Men wanting to naturally thicken their eyebrows. Say good-bye to everyday drawing of your brows. Our Ombre' Powder Brows have a soft powdered body, a sharp & defined lower line, a light diffused upperline and front, which creates the ultimate 3D brow shape and design. Cover up old eyebrows or faded eyebrows tattoo with 3D microblading method. Boost color and maintain your existing microbladed eyebrows shape. *Apply to current clients only. * New clients with previous microbladed eyebrows please look at Microblading Color Boost option. Create a sun-kissed, island girl look with faux freckles semi-permanent makeup. For more information on all of our permanent makeup services in Houston, visit our sister microblading site! Please read through the FAQs, BEFORE & AFTERCARE page as well as our TERMS & CONDITIONS page prior to setting your appointment to ensure that you are an ideal candidate for permanent makeup. Results varies from client-to-client and lifestyles. How the skin will react is different for everyone and many factors are to be taken into consideration. Skin type, age, scarring, diet, stress levels, facial products used, etc. all play a key role in how the pigment will hold, which is why it is important to know that more than one touch up may be required. We can guarantee that your face is important to us and that we will act in accordance with our experience and expertise to give you our absolute best. We can guarantee that we will strive to make you content every time. But there are no guarantees in this industry. Please think long and hard before you decide to go for it. **Organic Spa Houston require a credit card on-hold to book appointments. The time is reserved exclusively for you. We understand that things happen at the last minute so PLEASE, give us a courtesy call, email, or text at least 24 hours prior to your schedule appointment in the event you must cancel/reschedule to avoid a late cancellation fee. Late cancellation or reschedule on the day of the scheduled appointment will result in a 50% non-refundable, non-transferable service fee. No exception. When a client decide to no-call/no-show we loose business within those hours. We thank you for your understanding. We look forward to seeing you soon.